Jessie Hartland presents the fascinating 145-million-year journey of a dinosaur, a Diplodocus longus, from its discovery in 1923 in Utah to its arrival in the hallowed halls of the Smithsonian National Museum of Natural History in Washington, D.C.
For every third-grade boy who obsessively reads the labels accompanying the dinosaur skeletons at the natural history museum, there seem to be at least eight other school-age children aimlessly roaming the exhibits, bewildered by the towering piles of bones surrounding them. How to process all this visual stimulation? Could these fossilized bones possibly be real? Did any of this really once look like Jurassic Park? 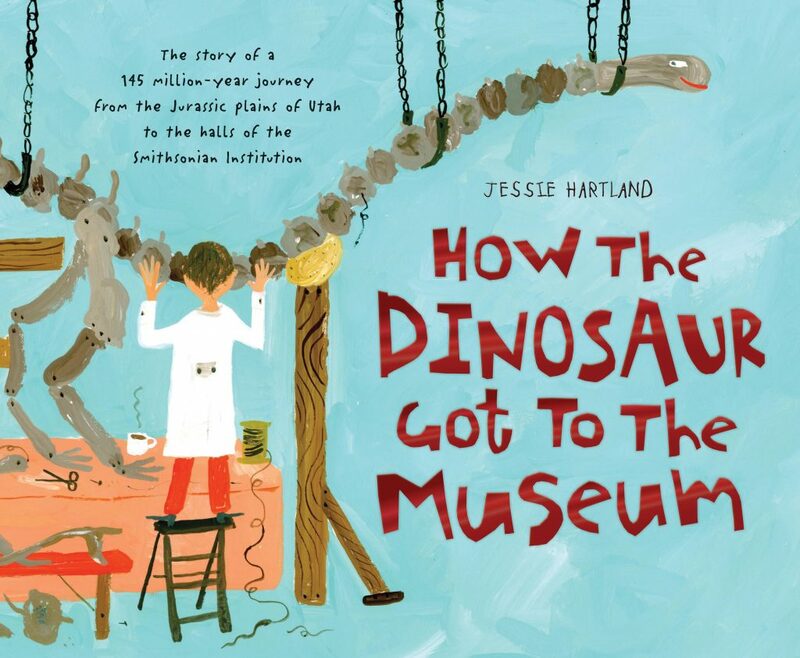 A new book, “How the Dinosaur Got to the Museum,” manages to tie the story together, and with decidedly greater realism than “Night at the Museum 2.” But it too is a sequel of sorts — the author-illustrator Jessie Hartland’s follow-up to last year’s “How the Sphinx Got to the Museum,” which traced the Hatshepsut sphinx’s journey from ancient Egypt to the Metropolitan Museum. In this instance, the museum is the Smithsonian National Museum of Natural History in Washington (sorry, A.M.N.H. ), and the titular dinosaur is a Diplodocus from Utah. After its leaf-munching days and its death by drowning, the Diplodocus passes into the fossil record until a dinosaur hunter takes up its story in 1923. Readers then follow its path and that of the people involved –- the paleontologist, the excavators, the preparators and the curators (the night watchman makes an inevitable appearance) — into the Smithsonian. There are welders and riggers alongside the exhibits team, each building on their collaborators’ work, as they create the final life-size figure that greets museumgoers. Endnotes provide further background information, but in a well-organized, digestible way. The result is both informative and accessible, and far from museum-diorama-boring. Hartland includes spots of humor, and her illustrations are dynamic, with just enough detail. At the same time, the text is factual and avoids the too-much-information pitfall that plagues so much nonfiction aimed at young readers. Best of all, this book opens up the workings of a science museum without resorting to special effects. After reading it, the kid who yawned his way through the last school visit may find himself longing to become a museum exhibit planner. If not Ben Stiller. Jessie has written and illustrated many picture books for children, including How the Dinosaur got to the Museum and Bon Appetit: the Delicious Life of Julia Child, a graphic biography for all ages. Out in 2013 was How the Meteorite got to the Museum from Blue Apple. Now published in over 10 languages, and just out in paper from Penguin Random House, Schwartz & Wade Books, is Steve Jobs: Insanely Great! It's a graphic biography of Steve Jobs and it's for all ages.